I first read about the artist Olafur Eliasson in a review on the ExhibitFiles website of his exhibition called "Take Your Time." 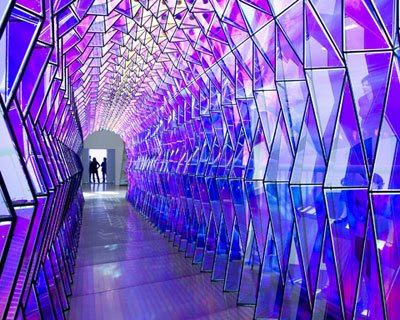 Clearly, everyone who saw and commented on Eliasson's work was enthusiastic, if not blown away. Well now I know why. I was fortunate enough to see the version of "Take Your Time" on display at MoMA in New York with my 13 year old son, and we both were delighted, amazed, and yes, blown away. Most of the installations in the exhibition were rooms or small spaces that used elements of light, color, optics, and geometry that really forced you to "take your time" (in a pleasant way) to appreciate truly magical and subtle effects. The majority of Olafur Eliasson's pieces were more subtle, and inpired a sort of hushed reverence in visitors, than most science center exhibit components. Also, to be quite honest, the unprotected nature of expensive (and hot!) lighting equipment just made me cringe. I even told my son at one point, "This stuff would last about 5 minutes in a science center before it got destroyed." But maybe those of us who design exhibits and experiences in the often frenetic, high-tech, super saturated world of science centers could take a page from Mr. Eliasson and strive for ways to create more intimate exhibit environments that whisper, rather than shout, our messages. But, don't take my word for it, search out Eliasson's work to experience in person. And ... take your time. If you'd like to read further about some thoughtful efforts to think about shifting the design of both exhibit components and museum environments to increase visitor engagement, I could not more highly recommend the book, "Fostering Active Prolonged Engagement: The Art of Creating APE Exhibits" available from ASTC. If you're new to the ExhibiTricks blog, subscribe via email or your favorite news reader with the tools on the right side of the postings!